Directions: For adults, chew one (1) tablet one to two times daily, preferably with meals. Other Ingredients: Sugar, Sorbitol, Vegetable Stearic Acid. Contains <2% of: Natural Orange Flavor, Silica, Vegetable Cellulose, Vegetable Magnesium Stearate. Vitamin C 500 mg. Chewable is rated 4.5 out of 5 by 20. Rated 5 out of 5 by Packam from A Quality V C It took some trial and error to find a good adult chewable vitamin C without all the sugar. This is a good one for me and I've been ordering it for awhile. Rated 5 out of 5 by Bob619 from Tasty, perfect for on-the-go Vitamin World's chewable Vit C is much tastier than the equivalent in Puritan Pride, which has a strange sweetness to it. 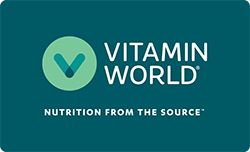 Vitamin World's chewable Vitamin C are very portable and easy to pop in your mouth during the day. I typically take 2 per day, one in the morning, and one in the afternoon (often while walking between meetings at work). Rated 1 out of 5 by sue from sugar? I had no clue the ingredients included sugar :( No sugar for me. I want a vitamin- pure not one that contains sugar! I mean come on. Rated 5 out of 5 by Pat from Great tasting Have been buying this product for a while, tried others, they dont taste as good. Rated 5 out of 5 by josephd405 from My go to to stay healthy I've used the chewable vitamin C for a long time now. I believe in its health benefits, and it taste great. Vitamin World has always been a great store to visit. The employees are always helpful and knowledgeable.